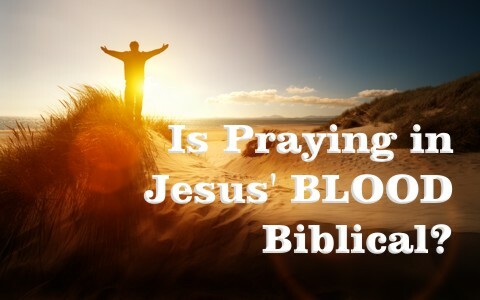 Is Praying In Jesus’ Blood Biblical? When people pray by the power of Jesus’ blood, are they praying biblically? There is power in Jesus’ name. That’s why we are told to pray through His name because He receives the glory in answered prayer, and the Father and Holy Spirit seek to glorify the Son, and that should be our goal. If you went to the White House and asked to get in and told them that your uncle sent you, they’d probably turn you away, but if you knew the name of the President and, most importantly, he or she knew your name, then there is power in that name. Enough to let you get into the White House, so the only way we can have our prayers heard and received by the Father is through Jesus Christ, “Therefore he is the mediator of a new covenant, so that those who are called may receive the promised eternal inheritance” (Heb 9:15a), and “the mediator of a new covenant, and to the sprinkled blood that speaks a better word than the blood of Abel” (Heb 12:24), so praying through Jesus’ name and not His blood seems to be accurate because “there is one God, and there is one mediator between God and men, the man Christ Jesus” (1st Tim 2:5), and there is no other…a priest, pastor, or even the blood of Jesus Christ. There is power in Jesus’ name just as there is power in Jesus’ blood for those who are brought to repentance and faith, but that doesn’t mean we speak the power of Jesus’ blood or pray for something in His blood to rebuke an unclean spirit or “declare someone will be healed.” That’s an abuse of Scripture and violates the command to pray for God’s will above our own. Our salvation was purely an act of God (Eph 2:8-9). It was something we could have never accomplished on our own (Eph 2:1), even if we plead Jesus’ blood, so although there is power in Jesus’ blood, in Scripture it is never used in prayer as some sort of force or power. It is declared a cleansing agent for those who believe, because the power of the blood is in the cleansing of sin, and we ought to thank God daily for that power. Everything else pales in comparison. It was “with the precious blood of Christ, like that of a lamb without blemish or spot” (1st Pet 1:19), and “if we walk in the light, as he is in the light, we have fellowship with one another, and the blood of Jesus his Son cleanses us from all sin” (1st John 1:7). The way it would probably read in Greek is, “the blood of Jesus His Son keeps on cleansing us,” so we are to be continually confessing our sins to God (1st John 1:9). Even though Jesus’ life, death (blood), and resurrection wrought in us His own righteousness (2nd Cor 5:21), we are still being continually cleansed. I did a simple search in my Bible app using the search words “Jesus” + “blood” and I only came up with 13 verses, but not one of them has Jesus’ blood being used in prayer. Rather, it is being used as how we were justified…redeemed by the precious blood of the perfect Lamb of God. I don’t know how this “praying in Jesus’ blood” started, but it is unbiblical, and although it may not be sin, it is not accurate. When the disciples asked Jesus how to pray, they must have seen Him as a Man deeply committed to prayer. He rose early to pray and sometimes prayed all night…Jesus was God but also in His humanity, a Man of prayer, and so it’s no wonder the disciples wanted to pray like that. They’d seen with their eyes all that Jesus had done. They wanted that intimate relationship with the Father, so Jesus basically tells them to pray to the Father (Luke 11) by hallowing or revering His Holy Name, and asking for His daily provisions, and I think it’s both physical bread and the “Bread that comes down from heaven” (John 6:33), that He was referring to, and by asking for His will to be done on heaven and on earth, we submit to His will in both and pray for His will above our own. Before Jesus was about to go back to the Father, He told the disciples “I will ask the Father, and he will give you another Helper to be with you forever, even the Spirit of truth, whom the world cannot receive, because it neither sees him nor knows him. You know him, for he dwells with you and will be in you” (John 14:16-17), and from that point on, whenever they were to pray, Jesus instructed them; “Whatever you ask in my name, this I will do, that the Father may be glorified in the Son. If you ask me anything in my name, I will do it” (John 14:13-14). Twice Jesus says to pray in His name…and in no other Scriptures are we told to pray any differently. Why pray in Jesus’ name? Clearly the Father seeks to glory the Son and by answered prayer, we glorify it because we prayed in Jesus’ name, but this name has power…His Word has resurrection power. When Jesus’ raised Lazarus, if He hadn’t specified Lazarus’ by name, I wonder if all had not come out of their graves because Jesus is the Way, the Truth, and the Life (John 14:6) and the Resurrection (John 11:25-26). Jesus! That’s the Name I want to pray in. If I could get into a clubhouse without a membership, I’d probably have to be a guest of one of the members. If I said, “Joe Smith invited me” they might let me in, so in a very limited sense, there is power in Joe’s name. That’s why I would use his name to get into the club and not just anything I could think of. Guess what would happen if I told the man at the country club gate, “You had better let me in…Joe’s got a lot of power…I’m declaring you let me in by Joe’s authority?” They’d probably call 911. Friends, we have the most powerful name in the universe to pray in…it is the Name above all names and the only Name that the Father will accept, so praying in the “power” of Jesus’ blood and then declaring your prayer request as done, is an affront to God’s sovereignty, but also to Jesus’ command to ask in His Name. That brings Him glory, and that matters very much to the Father. He takes the Son’s glory seriously. I think I should too. What about you? Read more about prayer here: How Should I Pray? Previous post: What Are Three Things God Wants Us to Lust After? Next post: What is the Wrath of God and How Do We Avoid it?